You are Tom McCarthy or Simon Critchley, General Secretary or Chief Philosopher of the International Necronautical Society. You are about to declare. 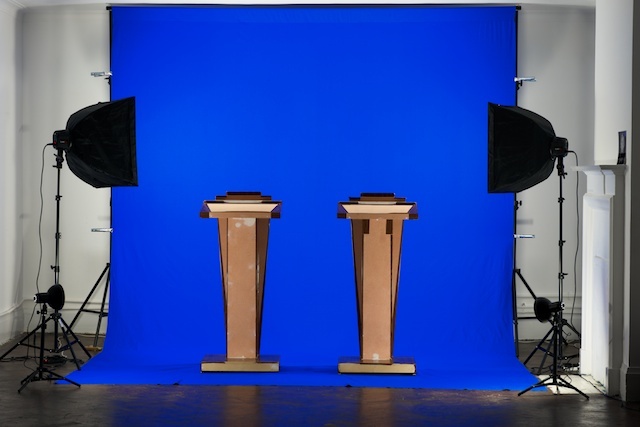 Two lecterns stand in front of you before a blue void: chroma-key muslin, corporate signature, cras ingens iterabimus aequor. The audience may be added later. The naked MDF surface, edged over with now-peeling plastic wood veneer is waiting for your script. Your speech is written in the document displayed behind you. Start by thanking Tate Triennial curator Nicolas Bourriaud for his provision of a platform for the delivery of this joint statement on inauthenticity. End by answering the question the way Lautréamont writes, ‘Each time I read Shakespeare it seems to me that I cut to shreds the brain of a jaguar’. Navigate the course from the individual, to the dividual, thence to the residual — ‘a remainder’ — and further to the risidual, a laughable doubling. Thus Wile E. Coyote outdoes Oedipus, repeatedly.